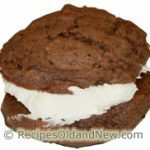 Chocolate Cream Whoopie Pies - Now....you're cooking! Try these for a special Valentine’s Day treat! I have been seeing a lot of recipes for Whoopie Pies lately, so I decided to make some. Most of the recipes called for shortening, and I am not a big fan of baked goods with shortening, so I finally found some recipes using butter that I was able to modify to my liking. Melt chocolate in microwave and set aside to cool. In beater bowl, beat butter and sugar until light and fluffy. Beat in the eggs. Stir in vanilla and melted chocolate. In a small bowl, combine flour, cocoa, baking powder, baking soda and salt. Add to creamed mixture alternately with buttermilk. Line cookie sheet with parchment paper and drop spoonfuls of dough 2 inches apart onto parchment. Bake at 375 degrees F for about 8-13 minutes (depending on the size you made the cookies) until edges are set. Cool 2 minutes and then remove to rack to cool completely. Filling: beat butter, marshmallow cream and icing sugar together until light and fluffy. Stir in vanilla. Spread filling on one cookie and top with a second cookie. I used a 1½ tablespoon cookie scoop to make the cookies and the recipe yielded 30 individual cookies for 15 whoopie pies. It took about 12 or 13 minutes to bake them. This made really big dessert size "pies". 1 tablespoon of dough per cookie would still make a good sized treat.